So sad & hate these kind of posts more than anything. 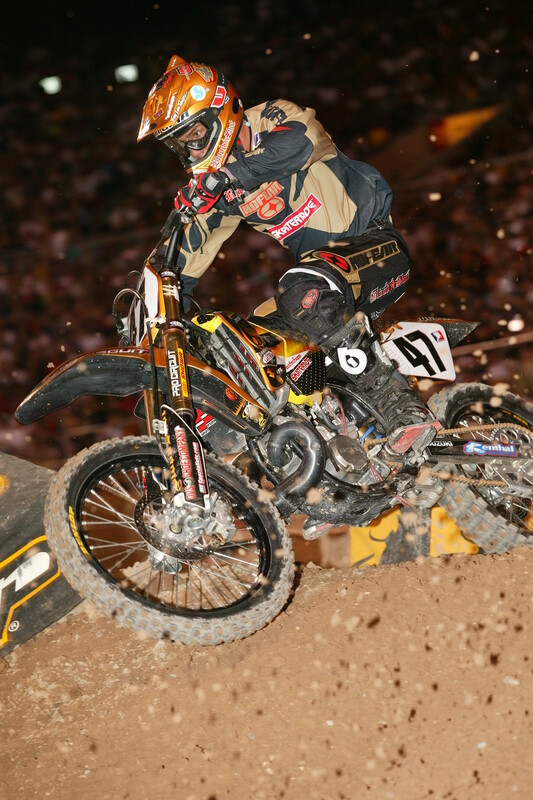 Just found out that my good friend & motocross bad boy legend Tyler “One Punch” Evens just passed away. I know you guys have probably seen the drama between me & Evans awhile back on IG but that wasn’t the person I knew. Tyler had a lot of bad demons like I once had & they got the best of him, which is the sad part. Evans was one of the nicest & raddest people I once knew when he had a clear head but the other side of him I didn’t want nothing to do with. I do know that he was trying to get help but sadly didn’t make it to that part. I hope others can hopefully learn from this & that this is what happens every time & there is no coming back. I love you Evans and will never forget all the great memories you, me, @twitchthis8 & Beau Manley had on Warpt Tour and all the early FMX days with the other @metalmulisha boys running amuck having the time of our lives. You will never be forgotten buddy! Last Saturday, September 15, 2018, former professional racer Tyler Evans’ life ended in front of the Rampart Police Station. How he even got there is a long and brutal story, which many are still trying to piece together. (Out of respect to his family, we’ll spare you the details.) What we do know is that the former Husqvarna factory rider and 125 supercross podium finisher was in something of a downward spiral ever since his racing career morphed into a freeriding, professional-wrestling, tough-guy existence that more than lived up to his “One Punch” nickname. He popped up from time to time online, and he even did a recent PulpMX Show interview with Steve Matthes that was honestly hard to listen to. Matthes himself described it as “erratic, almost incomprehensible and very, very confusing. He definitely wasn’t in a good spot.” Just listening from afar, it was obvious that there was a volatile cocktail brewing that sounded like a mix of time lived hard, reality hitting harder, regrets, maybe even depression. I didn’t know Tyler that well, though he was always pleasant to me when he was still racing. He was highly respected in NorCal, where he hailed from. I heard stories from time to time that were downright puzzling. Nick McCabe tried to do a “Where Are They Now?” feature in the magazine with him a couple of years ago, but it was hard to believe some of what he was hearing, like how Evans had picked up a Lamborghini and was driving it through LA when he ran out of gas, and how he got so mad that he abandoned the car—just left it there. He had made good money for a time but spent it as fast as he got it, and then he ended up in trouble with the IRS, and that led to other misadventures and mistakes and so on and so forth. If this all sounds familiar, it’s because it is familiar. We hear about similar tragedies in other sports, some famous guys, some not-so-famous guys. After their time in the spotlight ends and the challenges of normal life begin, they can lose their way. Sometimes it’s made worse by repeated concussions, sometimes by a dependency on painkillers, sometimes straight-up depression and disillusion, and sometimes all of those and more. Ironically, this week ESPN debuts its new documentary, Seau, about the NFL Hall of Fame linebacker Junior Seau of the San Diego Chargers, who dealt with depression after his career ended and ultimately lost his will to live. It's a must-see for every pro athlete, because it's not just about concussions or painkillers or depression, but the wholesale change in life that Stanton is talking about. Whether you're an NFL player like Junior Seau, a BMXer like Dave Mirra, or a motocrosser like Tyler Evans, sooner or later your career will end and you will be dealing the challenges of not only being an ex-athlete, but facing a regular world that you've never really known, and may not have the support system around you to deal with it. As you saw today, the French team replaced the injured Romain Febvre with Jordi Tixier for the Motocross of Nations, and our buddy LeBig has been all over this over on his (French-only) site, LeBigusa.com. 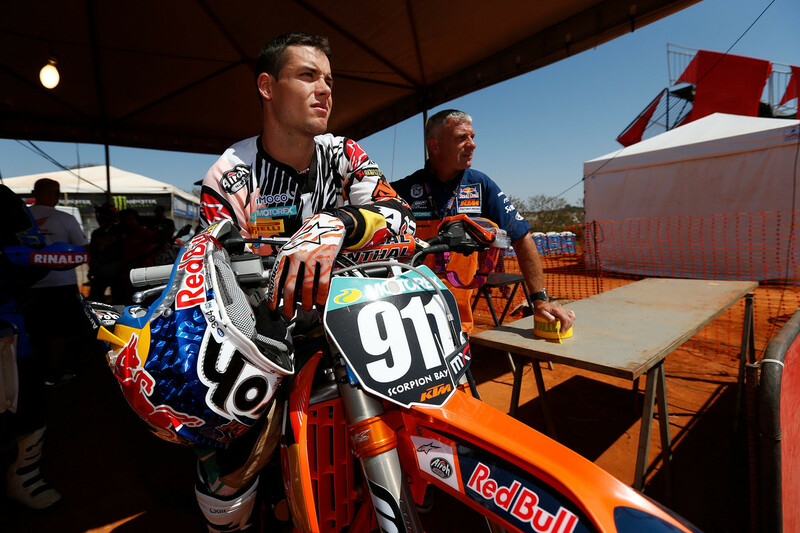 According to LeBig, the French team has a real pickle on their hands, as it seems that team member Gautier Paulin doesn't get along with Jordi Tixier that well and at one point threatened to pull himself off the team if Marvin Musquin didn't agree to fill in for Febvre rather than Tixier. Of course, we know Musquin rightly told the team to go pound sand when asked, and this goes along with the French team banning Dylan Ferrandis' coach David Vuillemin from the tent for him (rightly, I might add) criticizing the decision to not have Musquin, the 2018 RedBud 450 National winner, on the team. You keeping track of all this so far? According to LeBig's sources close to the French team, Jacques Bolle (FFM president) threatened his staff to pull the plug and not go to Michigan at all if they don’t find a viable solution. Things are clearly tense inside the champions’ team. I agree with that last sentence: if the French had sent Marvin, Paulin, and Ferrandis, they'd be coin-flip with Team USA in my mind to win the event. Instead, it's all gone south, team morale seems to be shot, and the French team PR waiting until the end to sort of take a shot at Marvin for declining an invite seems like the final nail in the coffin for Musquin ever riding for France at the MXoN again. One last note: The Montreal Supercross returned last weekend and I did Observations on it all right here. 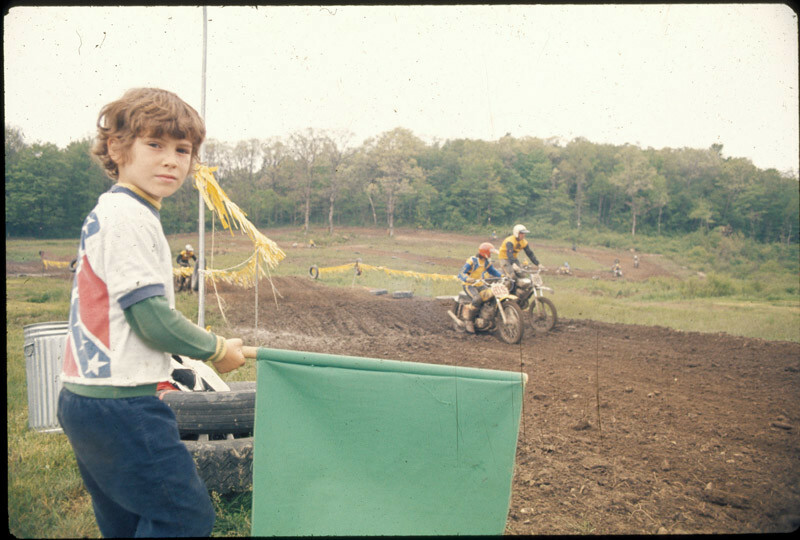 The first motocross track my dad and mom ever opened was called Appalachia Lake. It was located about 30 minutes east of Morgantown in a little place called Bruceton Mills, West Virginia. They started it in 1973 and ran it through 1975, when the campground/country music venue affiliated with it went belly-up. But before that happened, they ran two AMA Nationals there and the last Inter-Am race ever, as well as the ugly attempt by a daredevil named Bob Gill to jump the lake on a Kawasaki street bike that ended in his paralysis. (My parents never did get involved with another event like that again, including freestyle motocross.) Appalachia Lake never held another race after the end of that ’75 season, but a racing family from Maryland that was there often decided to buy it a few years later and live near the track. I’ve ducked in from time to time just to see the old shadow of a track, which one can still make out in the grass of the valley. My dad is Doug Smith, my grandpa was Dave and my grandma is Pat. My grandpa bought Appalachia Lake in the 80s and my grandma still lives up there. Long story shortish, the dam up there seems as though it slipped through regulatory fingers for a number of years and then popped back up on their radar. 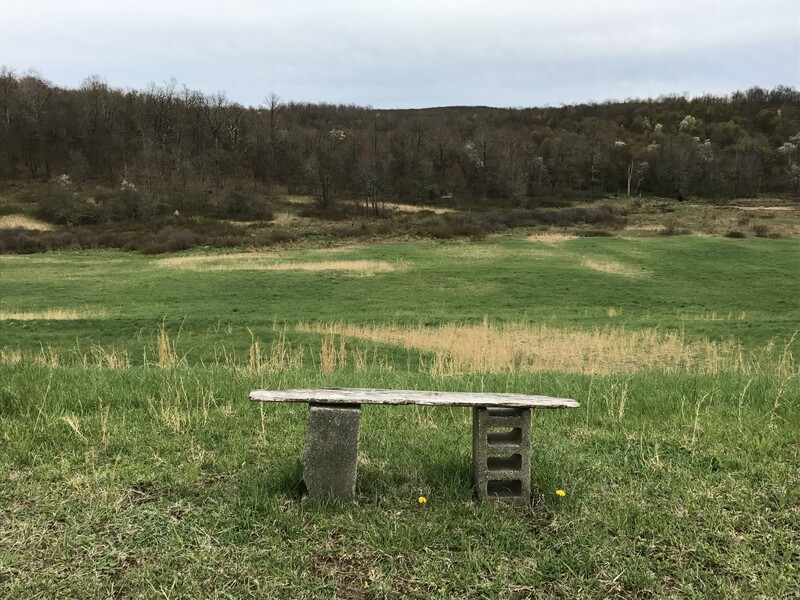 It was recently inspected and deemed a hazard due to its proximity to the road and the erosion that has taken place so it needs repaired/replaced. That costs an astronomical amount of money, but one of the environmental agencies does a program where they return manmade lakes to their natural state and the landowners don’t need to pay for it, as it’s a grant-type thing. So that’s the option we took. I met my parents up there a few weeks ago to stay for the weekend because the process of dam dismantlement is starting soon. Around the time I went up I read the article where you talked about visiting the old kenworthy’s track and you mentioned Appalachia Lake and I thought it’d be nice to update you on the action. So if you feel like having a misty-eyed look at the lake, I’m not sure how much longer it’ll be there. Nothing else will change and the field the track used to occupy will still be there! Toby Tyler was a movie character no one will remember unless they watched a 1960 Walt Disney movie called Ten Weeks With a Circus. I’m undoubtedly one of very few of your readers who can remember the show, as most weren’t even born until decades later. Suffice it to say, the movie traced young Toby’s adventures traveling with the circus. This past summer, through the gracious hospitality of MX Sports Pro Racing and Racer X, I got to travel with the circus known as the Lucas Oil Pro Motocross Championship. I guess Toby was part of my inspiration. At 65 years old, with my years of racing motocross well behind me, I found myself without my dear wife of 45 years when she succumbed to cancer in the winter of 2017. As our entire family grieved, my son Blake realized it might help if I got out of the house and focused on something else. He was right. As a former pro, he had maintained enough contacts to secure a season pass for me, and I was off. In the middle of May, I loaded up the R1200RT and left Illinois, headed for Hangtown. Three and a half months later, after making it to all 12 rounds plus a number of side trips, the circus was over I was home again, and the RT had nearly 21,000 more miles on it. Wow, what an adventure. In addition to being front and center for the finest motocross racing on the planet, I got to visit relatives and friends all over the country. I also had the opportunity to spend time at lots of places I had been interested in but never took the time to experience before. Oftentimes, it was impractical to travel all the way back to Illinois when the next race was only several hundred miles and one week away. Such was the case between Hangtown and Glen Helen. So I explored the California Gold Rush territory, enjoying day after day of great mountain roads and scenery. What a blast. The BMW was in its element, and I felt like I was too. Later in the season, I spent time at numerous Civil War battlefields and sites out east. Did you know there was a Civil War fort on the West Coast? I didn’t, but I do now because I was there. I explored a ghost town in Montana and the site of the 1969 Woodstock Music Festival in New York. I stopped by Slippery’s Bar in Wabasha and spent time exploring Wild Bill Hickok’s old haunts in Deadwood. I waded in Lake Michigan and took a short hike on the Appalachian Trail. 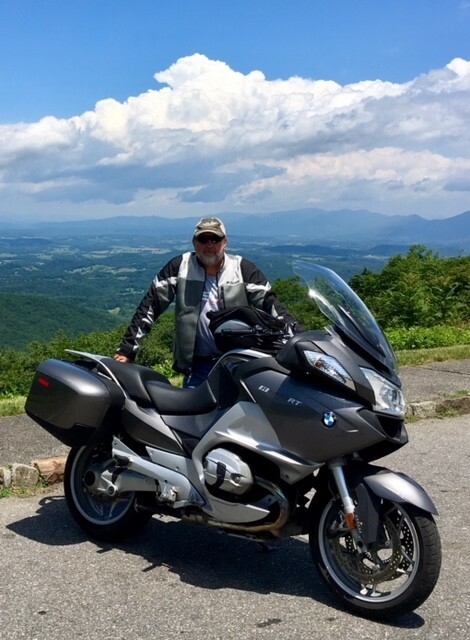 I rode across Nevada on the “Loneliest Road in America,” and I had a personal guide lead me on some of the finest roads in the Berkshires, thanks to my good friend Neil and his wife, Pam. In short, I had a blast. What a summer it was: epic races, spectacular scenery and roads, endless motels and diners (good and bad), a few campouts, and, most importantly, time spent with old friends and new. I’d like to thank everyone who played a role in helping and/or hosting me as I made my way from coast to coast—twice. The adventure of a lifetime. Toby would have been proud. If All In doesn’t get you psyched up for RedBud, nothing will! 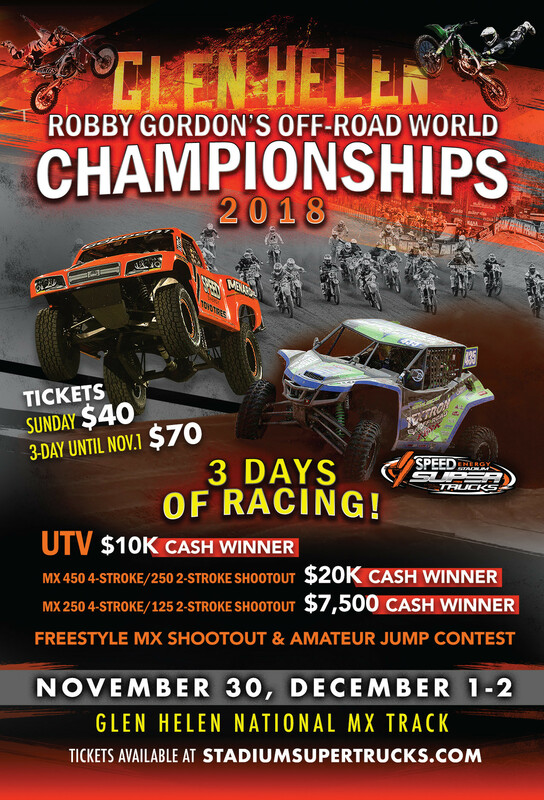 Registration is now open for Robby Gordon’s Off-Road World Championships, November 30 to December 2, at the Glen Helen Outdoor National MX Track in San Bernardino, California. Qualified drivers who are interested in competing can contact Chris Hecht for further information how to be involved. Chris can be contacted through email at checht@stadiumsupertrucks.com or by phone at (704) 949-1255. All races and events will be contested on the Glen Helen Outdoor National MX Track. NOT the Short Course Track! Qualifying will take place on Friday for moto one on Saturday and moto two on Sunday for SST, motocross 450 four-stroke/250 two-stroke Shootout, motocross 250 four-stroke/125 two-stroke shootout, and UTV. 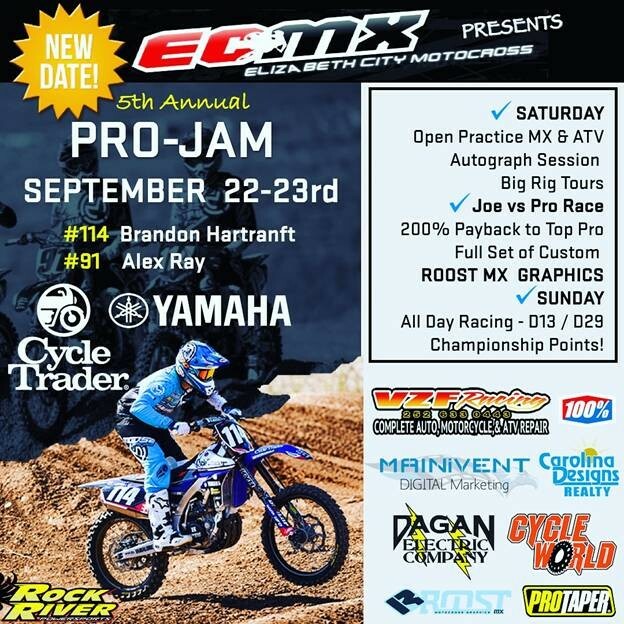 Competitors in both motocross divisions and UTV will need to qualify to race the main event motos. Competitor registration and payment can be completed with ease online here. On top of entry fee, all competitors will be required to hold a single-event USAC License to compete. Off-road and lifestyle vendors are welcomed and encouraged to take advantage of the Christmas shopping season by displaying or selling their new 2019 products in the Off-Road Championship Expo. Sizes and pricing are below. Registration and payment can be completed here. On Thursday September 27, Maxima Racing Oils is again celebrating the day for two-strokes: 927 Day. 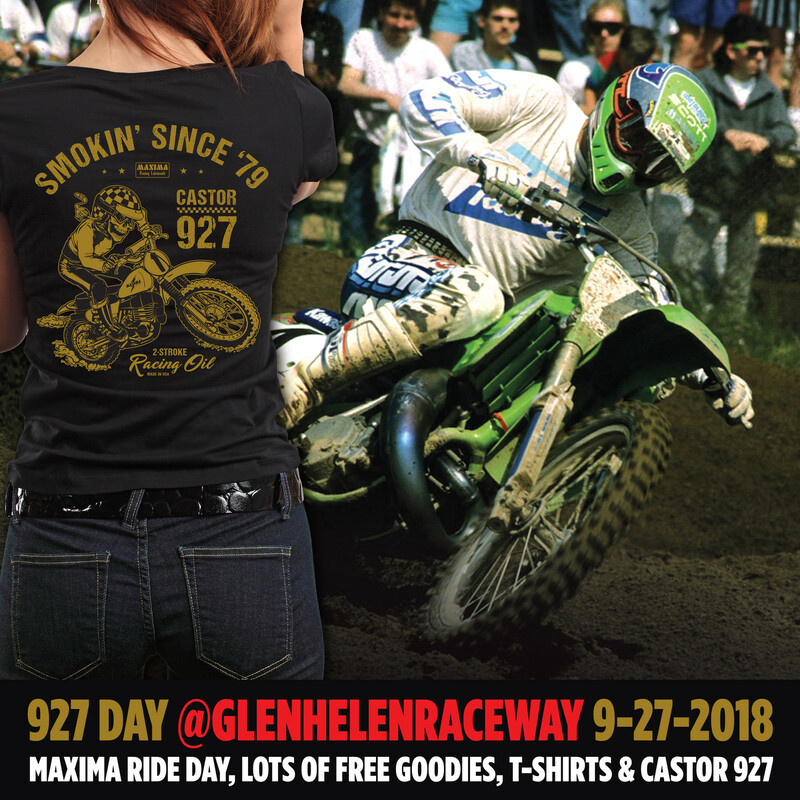 The Maxima staff will be at Glen Helen Raceway showing off their newest products, providing product support, and giving those on two-strokes some free goodies! 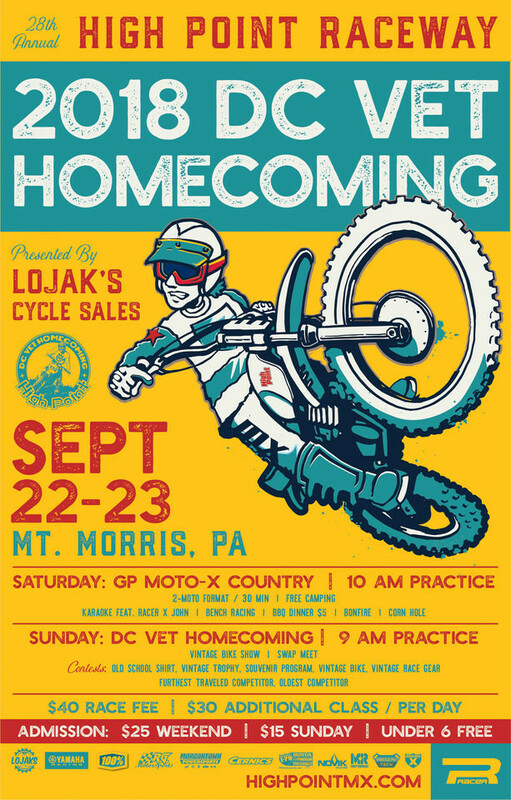 "The Dogger" Ron Lechien will also be there spinning laps on his KX500 and signing posters. 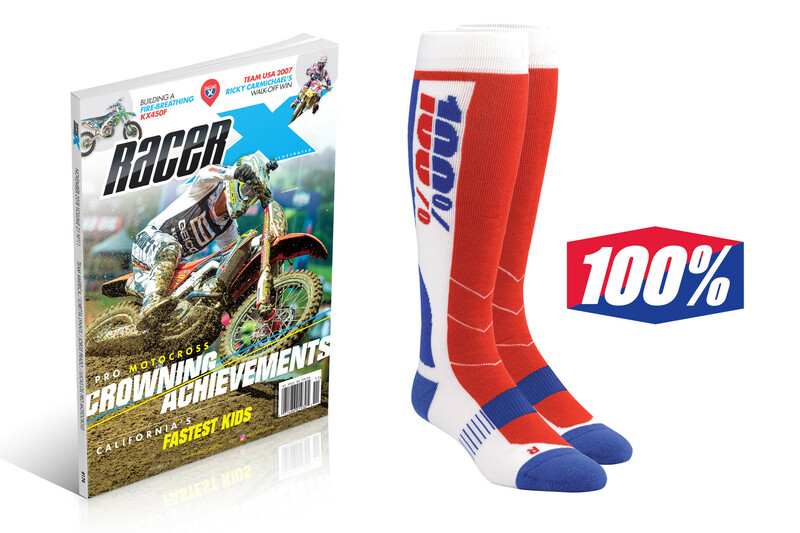 The first 100 two-strokes through the gate will get a free bottle of Castor 927 and a cool T-shirt! Normal hours, normal gate fee applies. Go to www.GlenHelen.com for more information. 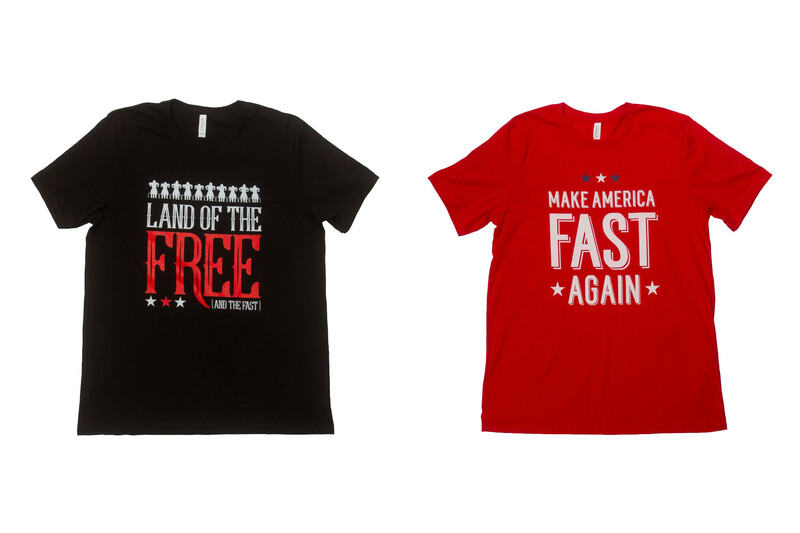 Show your support for Team USA at the Motocross of Nations this year at RedBud by picking up one of Racer X Brand's tees from the Patriotic Collection!